I made this in a large non-stick Wok, but any large pan will do just fine. This dish will feed 2 (Svendblad’s) or 4 people for dinner with a side dish. We chose to make some Cauliflower rice, since we love it so much, but without bacon this time and white Cauliflower rice. 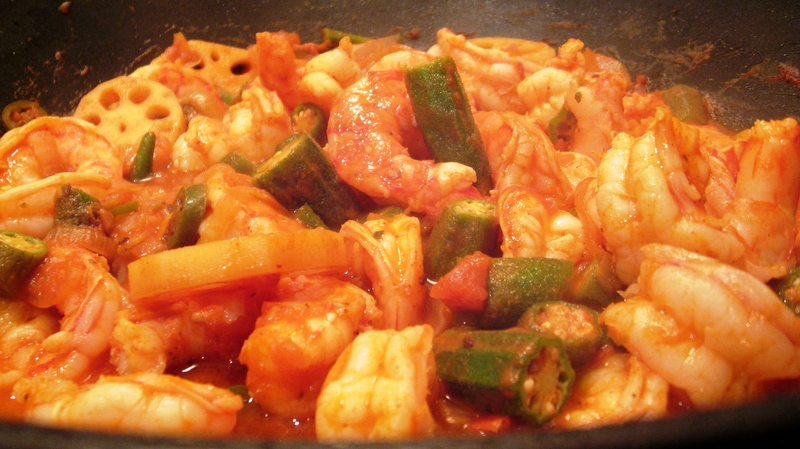 Continue to cook on medium heat for another 5 – 7 minutes, then add the shrimp or prawns and cook on medium heat until all prawns are no longer transparent. Serve with your favorite side dish. What do you like better Henry’s Okra and Ground Beef or my creation?